Richmond’s on another list! This time, instead of an editorial list, someone with opinions or a buzzfeed byline, we’re making the grade with the hard-nosed U.S. Census Bureau. So there’s mixed news here. The good news? We’re in the mix, where we need to be. We’re stacking up with some top cycling cities and holding our own. The shortcomings? While big cities like San Francisco and Washington DC top us, so do some pretty modest-sized cities like Madison, Wisconsin and Tucson, Arizona. Richmond’s got every opportunity to be doing as well as these fellow mid-level towns. Heck, we made this list and we only have 5 miles of trail in place to date. Imagine what we can do with 20 more miles in play! That’s exactly what we’re working towards. The 2015 World Cycling Championships have made Bike Walk RVA’s Connect RVA Campaign to build 20 miles of family-friendly lanes the official legacy project of the impending races. Give Richmonders some safe, comfortable infrastructure and watch our rates of bike commuting take off! Tons of us love riding, or really want to try it, but we’re not comfortable doing so without places to ride that separate us from vehicle traffic. 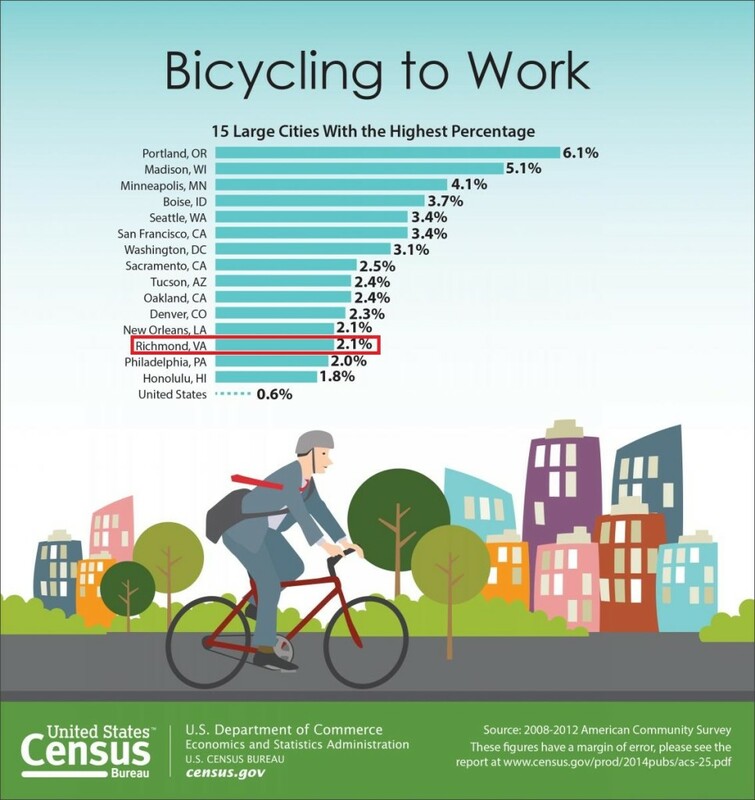 The League of American Bicyclists (LAB) break down some of the nationwide statistical takeaways, and they’re intriguing. First off, there are 60% more people bike commuting today than there were a decade ago. Men are using their bikes to commute 3 times more than women. People of color are biking more than anyone else. The average length of a commute in the U.S. is 19 minutes. LAB notes that all these stats are limited only to commuting, so they don’t include recreational riding. The trips you make to the park or the bar or the miles you pedal for exercise aren’t counted. Richmond’s become a real recreational riding paradise, so we’ve got great momentum to build on!